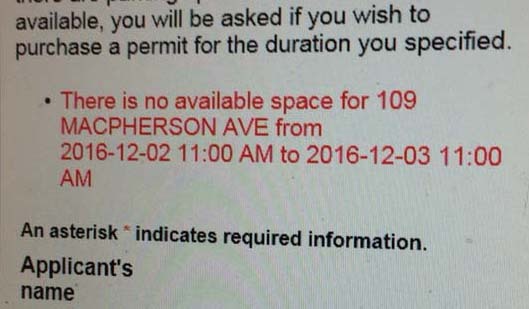 Yonge and Roxborough News: Try to buy a temporary parking permit lately? Good luck! Try to buy a temporary parking permit lately? Good luck! With the Enbridge construction on Macpherson and Roxborough finished, this pops up when trying to buy an overnight permit online in the 5H area. There is some equipment left but not enough to affect parking. Also, 5H is a large area and not all of it was affected. They will issue one if you go to City Hall. What a City!